I despaired a year or two ago, when I realized I had lost the electronic copy of the sermon my wonderful friend and fellow sojourner, Michael Wyatt, preached at my ordination. Today, I spent the morning packing and clearing out of the office I have been privileged to occupy at St Ambrose. 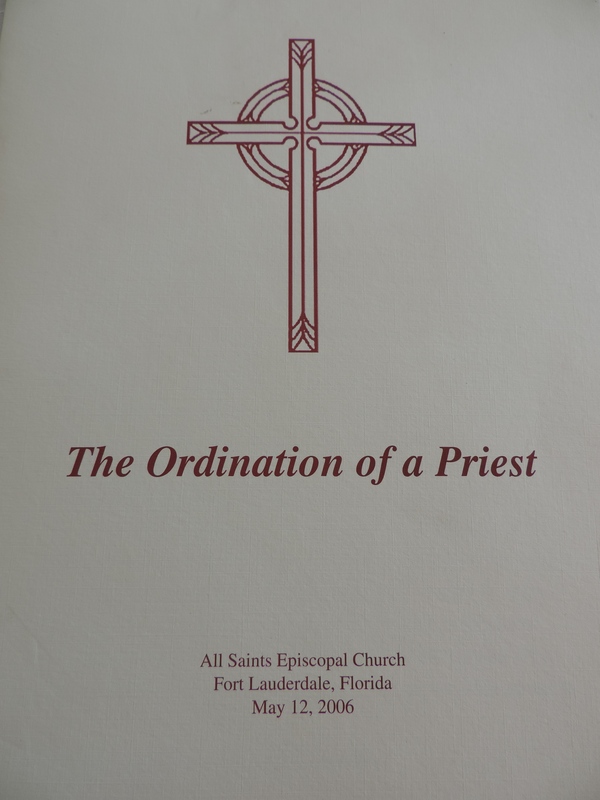 In one on my files, way in the back of the closet, I found a copy of the bulletin from the night of my ordination, and tucked in it, the copy that Michael did a few last edits on, in his amazing script, and then read from the pulpit. Today, the day before I preach my last sermon at St Ambrose, perhaps my last 24 hours as a parish priest, it was good to stop and read what was said to me on the evening of my ordination. Isaiah…throughout his life, stood there, between the people and God, the one in the middle, the one who dares both the vertigo of divinity and the doldrums of humanity. Priesthood, Rosa, is this mystery: to be unafraid of both sides and to undertake to love them both. The priest stands, as Isaiah did, between the silted sullenness of the community and the shuddering tempest of heaven, between flesh & spirit, the priest stands at the site of the soul. A priest knows where those border crossings are and can usher others, night after night, across them. A priest awakens that ability in others, in individuals and in communities, awakens in them the power of their own prayer and the fullness of their own ministry. The priest’s own faithful devotion and service holds others up to walk, an arm around their shoulder, until they run in the strength of God. God grant that the days of your ministry, Rosa, not be days of hard hearing and dim seeing, but days of healing for our church, days of justice–not the excusing of the rich, but the protecting of the poor, not the endorsement of the powerful, but the incorporation of the disenfranchised, not the imposition of patriarchal norms but the discovery of God’s joy in all that God has made. Remember, the challenge of this mediation is always the mystery of the flesh, which we fear and call unclean–but salvation falls short if it is not of the flesh as well. Then, as we always had during the long, incredible conversations I was privileged to engage in with Michael, he broke into Spanglish. How I would have loved to talk to Michael today. These unexpected words from him suffice, though. I am grateful for the friendships and companions in the journey I do have and who are so generous–I will talk to my friend Joe in just a few minutes. The habits and practices of all these years of ministry are about to kick in too–a visit with Maria, a simple dinner, time to walk and reflect one more time on the lessons and early bedtime. They will carry me. At about 4:30 tomorrow morning, one last time, I will get out of bed in the dark to sit in the quiet of the early morning, making the final edits on my sermon and gathering myself up to offer those gifts I have such a hard time believing are worthy, one last time, at St Ambrose.